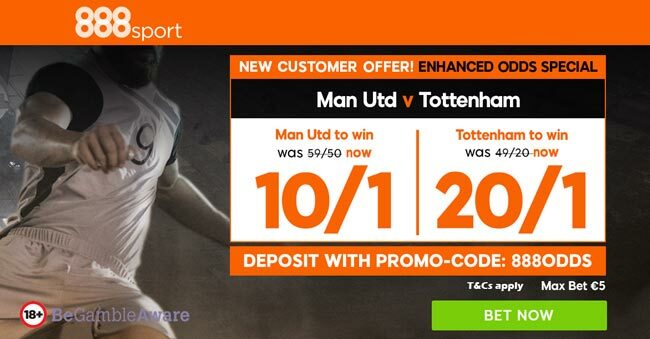 Get 10/1 Manchester UTD or 20/1 Tottenham to win at 888sport! Max bet £5! Manchester UTD and Tottenham go head to head in an unmissable Super Sunday clash in Premier League. Are you placing a bet on this match? 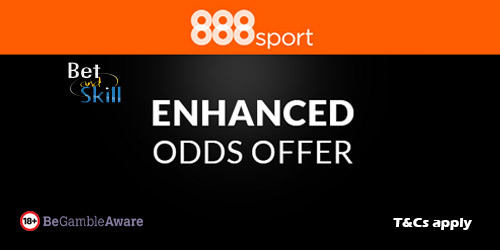 888sport are offering enhanced odds - Manchester UTD to win @ 10/1 or Tottenham to beat Man UTD at 20/1! Max bet £5! Man UTD have won 20 of their 25 Premier League home clashes against Tottenham (W20 D3 L2), but Pochettino's men defeated Man United 2-1 the last time the two sides met. Join 888sport and choose your price boost - 10/1 Man UTD or 20/1 Tottenham to claim the bragging rights! "Get 10/1 Manchester UTD or 20/1 Tottenham to win at 888sport! Max bet £5!"